Malcolm Gladwell, one of my all-time favorite authors, recently started the Revisionist History podcast. In his typical style, it is absolutely amazing! "Each week for 10 weeks, Revisionist History will go back and reinterpret something from the past: an event, a person, an idea. Something overlooked. Something misunderstood." In the middle is a three-episode series about education in the United States. 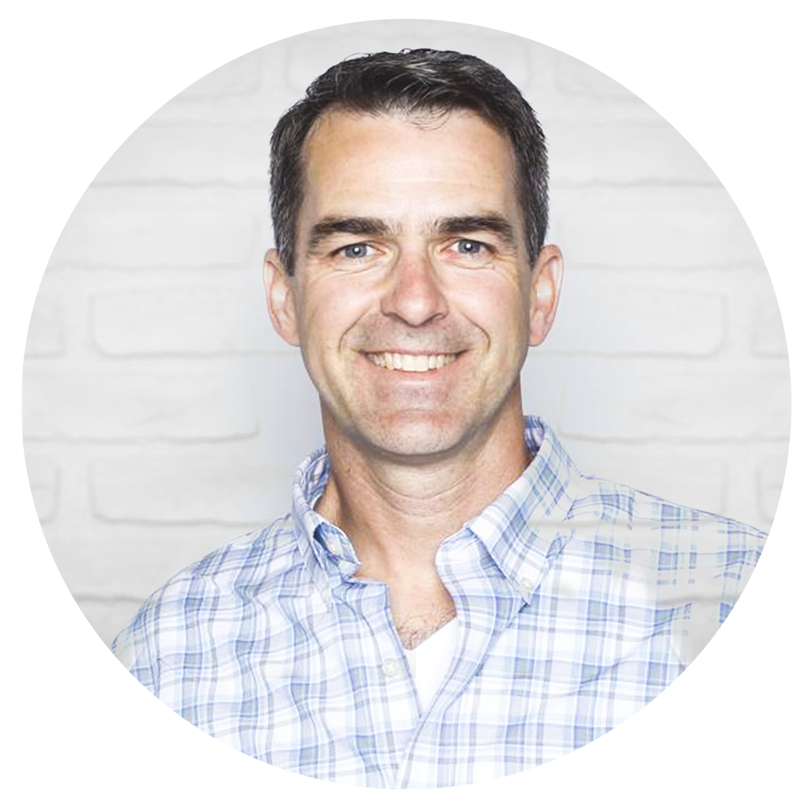 One story in particular caught my attention and, coincidentally, I happened to listen to this podcast on the same day that The Data School was working on their dashboards based on the College Scorecard data. Here’s Gladwell’s summary of episode 5: Food Fight! In the spirit of not accepting statements as fact, I decided to create this visualisation comparing the two colleges. In every section I start with a similarity then next to it I point out a difference. This really helped me compare the schools and confirm much of what Gladwell spoke about in the podcast. About 3 1/2 years ago Alberto Cairo came to give a talk at Facebook. It was an incredible talk and immediately after I built a viz about how he built his book cover for The Functional Art. One thing bothered me when I built it though; I wasn’t able to include the vertical lines like he did…until this past weekend when I finally figured it out. So today, while The Data School works through their next dashboard during Dashboard Week, I decided to build it again, this time with the vertical lines. I had to do a lot of finagling with the mark labels. Click on the image below to view the interactive version. In this week’s Tableau Tip Tuesday, I show you how I created a slope graph that includes vertical lines. I really like the addition of the vertical lines as they add structure to the overall look and keep the viz neatly aligned. This was originally posted as a Data School Gym challenge, which you can view here. Following on from last week’s discussion about Makeover Monday and what might be keeping people from participating, Andy and I are committing ourselves to keeping our visualisations simple and quick. The data set provided this week has A LOT of census information included, but I focused on the data from the original post. Here’s the original from Rhiannon Fox, a graphic designed based in Bermuda. I spoke to Rhiannon about her work and I’m hoping she becomes part of our teaching curriculum at the Data School. She’s very excited to see what everyone comes up with. A unit chart sacrifices accuracy for engagement. The overall pattern is harder to see than it needs to be. It’s too difficult to compare females from year to year. Given what I like and don’t like, and sticking to the one hour time limit, I decided to go with a diverging bar chart, also known as a back-to-back bar chart or a bikini chart or a population pyramid. It’s my birthday, so what else would I be doing other than practicing Tableau and having a cold beer? I’m working on a project (more to come in a couple months) and needed a way to create vertical lines in slope graphs that are based on dimensions. So here’s your challenge. Given this data set of fruit sales by region, build this slope graph. If you can’t access the data, email me and I’ll send it to you. I used Avenir Next Condensed for the font - 18pt title, 12pt in the chart. The decreasing value is highlighted with color #E15759 and the increasing values are using #A5ACAF. This was a fun little challenge for me. You’ll likely either get it immediately or get stuck. Upload your answer to Tableau Public and leave a link in the comments. Have fun! I need to get back to my Punk IPA. 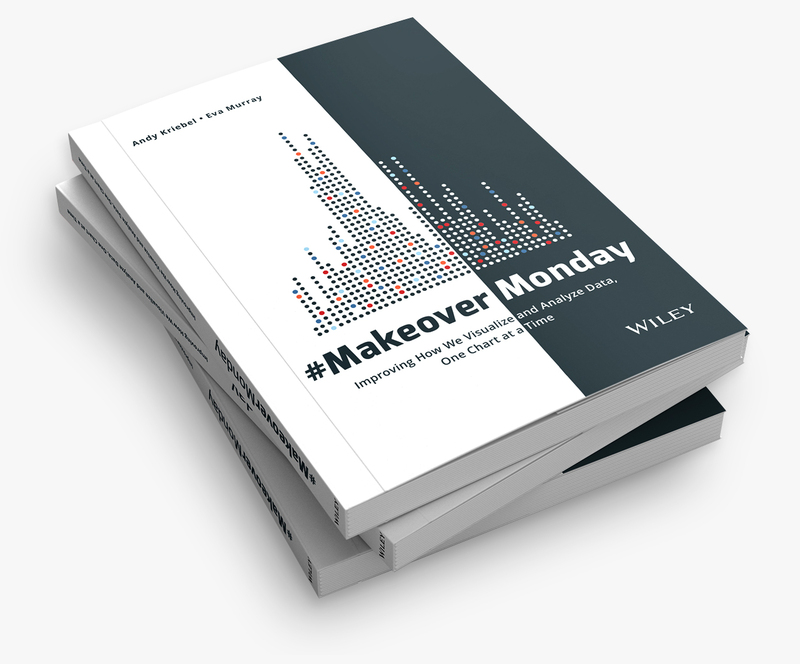 Downloads vs. Vizzes - Why aren’t people sharing their Makeover Monday creations? A couple weeks ago, I started using a shortlink service for the links to the Makeover Monday data sets. Each week I publish both a flat file (Excel or CSV) and a Tableau Extract. When Andy and I started this, we figured a TDE would be the easiest way for people to start. But I was wrong…well, that’s assuming the last 2 weeks are representative of every week. To our surprise, people are using the Excel files at about a 2-to-1 rate to the TDE. That was surprising enough; I just assumed people would use the TDE because it’s simpler. And look at those download numbers! 285 people downloaded the week 28 data and 219 have downloaded week 29 (as of this writing). I combined that with the number of vizzes uploaded to Twitter for those weeks and tagged #MakeoverMonday. I’m curious. Who are these people that are downloading the data, yet not sharing their work? Do you have any ideas as to why aren’t they sharing their work? I don’t have the answer. I’m hoping you, the Community, can help explain this. What can we do to encourage more people to share their work? Are we doing anything that may be putting them off? Please share your thoughts in the comments below. Thank you! In this week’s tip, I look back at the Makeover Monday dashboard I created for week 29 and some tricks I learned about designing a long form dashboard. This week’s Makeover Monday is a bit morbid, as pointed out to me by David Pires. Regardless, it’s a fascinating data set and often a devisive political topic in the United States. The data for this week come from The Death Penalty Information Center Exectution Database and the charts of reference come from The Marshall Project. Next up is a stacked bar chart of executions by race (or method) over time. For the by method view, it would be better to have lethal injection at the bottom of the stacked bars since it’s the largest. The third chart is a line chart showing the volume of exections by state. This is the chart that first caught my attention. The logarithmic scale is very misleading and isn’t called out. The colors are way too hard to see against the dark background. My eyes have to go back and forth between the chart and the table to know which state is which. As for my visualisation, I decided to take some advice from Rob Radburn. At a recent London TUG and against during the Zens on Tour event, Rob spoke about how he gets inspiration from visualisations and how that influences what he designs. In essence, he says to “Steal Like an Artist”. So that’s what I did this week. A quick Google search for “death row infographic” and I had three visualisations that I could borrow from and combine into my final version. They are this one and this one from Huffington Post and this one from Visual.ly. I felt an infographic was the best way to tell the story this week. I hope you like it. Today was my day to keynote Zens on Tour. Louis Archer asked me to present about Dear Data Two because he had heard about it during a recent London TUG. I was able to record most of it…for some reason it cut off near the end so apologies for that. Below the view are the slides from the presentation. Enjoy! This week’s Tableau Tip Tuesday came about from a question during the panel discussion portion our Zens on Tour event in Edinburgh yesterday. Zen Master Craig Bloodworth came up with a very elegant solution that I’ve built upon. This is super handy for those that need to build dashboards for accessibility purposes. Makeover Monday: Where Are the Best & Worst States to Raise a Child in America? This week the UK Zens are on Tour and we’re taking Makeover Monday on the road with us. And it’s Independence Day in America so I chose a visualisation about raising children in America. Happy birthday ‘Merica! The colors make is easy to see the good and bad concentrations. Alaska and Hawaii are neatly brought in under the continental U.S. The ranges for the colors are equivalent. Using a filled map could lead to visually distortion; poor Rhode Island! The separate maps that you have to page through make comparisons too difficult. There’s no way to see a State’s ranking in all categories at once. I iterated through lots of ideas this week and found two that I think work well. I changed the filled map to a hex map then put all of the maps side by side. I created heat maps and bump charts that show the individual State rankings in each category. I added bar charts in the tooltips. Both views are shown below. Which one do you prefer? FFS Friday: Which SEC Teams Lost the Most Offensive Production? There are just too many visualisations screaming out for makeovers. Following on the huge success of Makeover Monday, I’ve been occasionally sprinkling in other days, like #WTFWednesday and #FixItFriday. But Fix It Friday didn’t really do it for me, so today I’m changing it to #FFSFriday. Not sure what FFS is? Google it. Today I’m going to look at this viz from Saturday Down South. The title, while clear, doesn’t tell the story as well as it could. For my version, I changed the story to be about the teams that lost the most offensive production. The tooltips help to provide the addtional content, moving the numbers out of the visualisation and reducing distraction. If you’d like to give this chart a makeover, you can find the data here (XLS) and here (TDE). Then post an image on twitter with the hashtag #FFSFriday. Most importantly, have fun!